The marketing goals for the Facebook pages vary but quite often the simple goal of just increasing their fan count to their Facebook page seems to be top of the list as brands have worked out very quickly that being able to communicate to 1,000’s or even millions of fans via a simple status update is very efficient highly leveraged marketing. Companies have also realized that people’s main reason for becoming a fan for the most part is not so charitable, but is about having access to the latest special offers and freebies. The Department store Kohl’s gave away $10 million to various schools decided by the votes of their fans on Facebook. It was an excellent promotional campaign as the 20 schools with the most votes were each given $500 thousand. 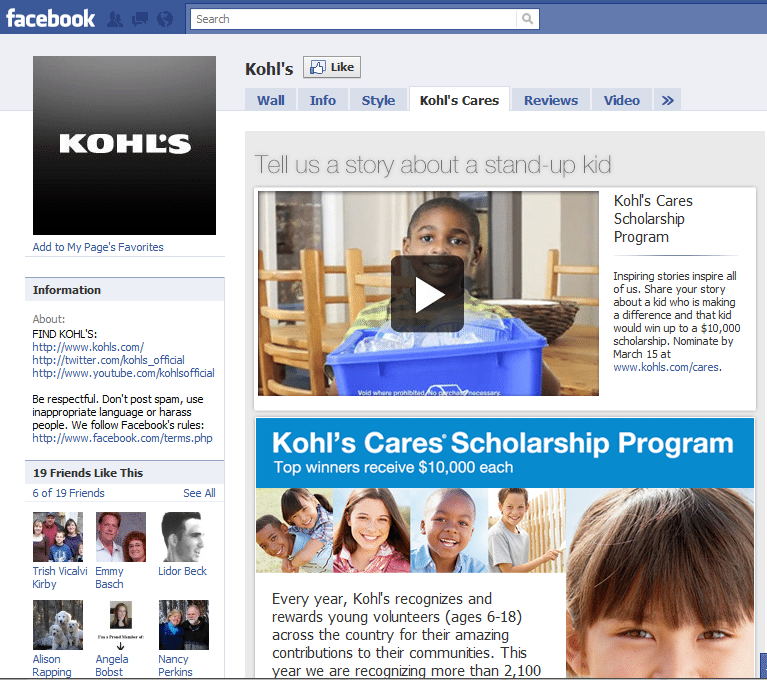 Kohl’s Facebook page sky rocketed to well over a million fans, and the winning schools each tallied well over 100,000 votes. 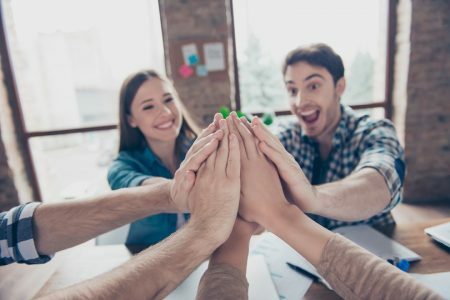 Kohl’s hit it out of the park so to speak with this campaign centered around the social network, and they did an excellent job utilizing social media tactics to help in its social responsibility efforts. In February of this year, popular department store Target left the choice of where to donate $1 million into the hands of their fans on the social network. The company used an application titled “Super Love Sender” and kept fans updated in real time which charity was in the lead. St. Jude Children’s Research Hospital ended up being the winning charity. 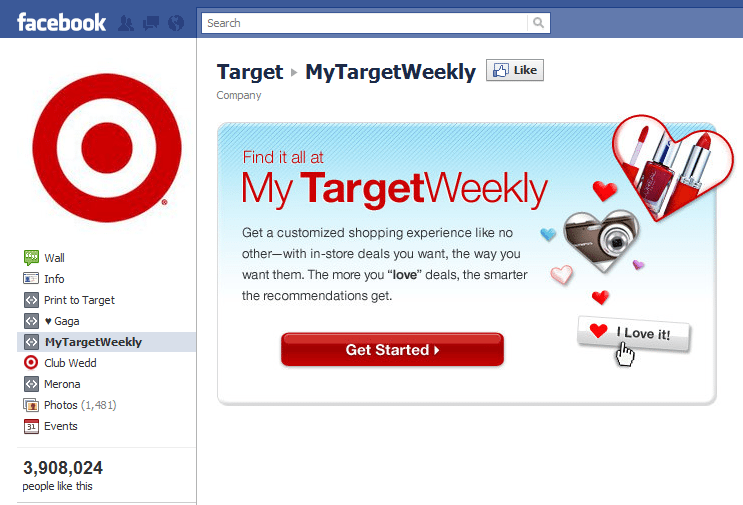 Overall though, the excellent campaign was a complete success as it created quite a boom on the store’s Facebook page. 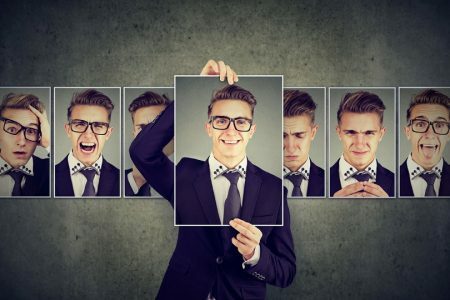 2010 saw a shift in Ford’s promotion techniques as they began gearing their campaigns towards social media outlets, and they really pushed the boundaries with innovative ideas. 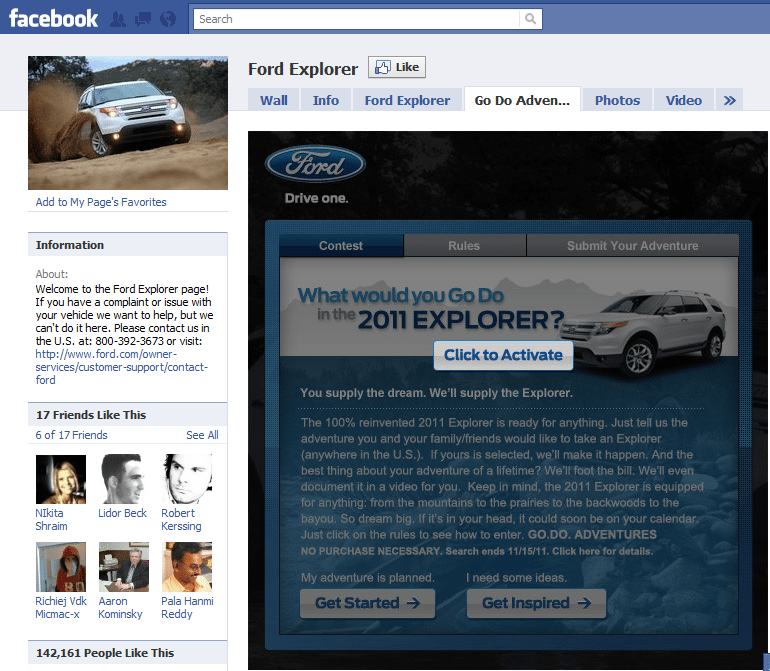 This past summer they released tidbits of info leading up to a Facebook event unveiling the 2011 Ford Explorer. The campaign was the first time a car company has ever used a website to reveal their new model as opposed to an auto show. Ford also went as far to randomly select one of their fans to giveaway a free Explorer upon their fan total surpassing a certain number. 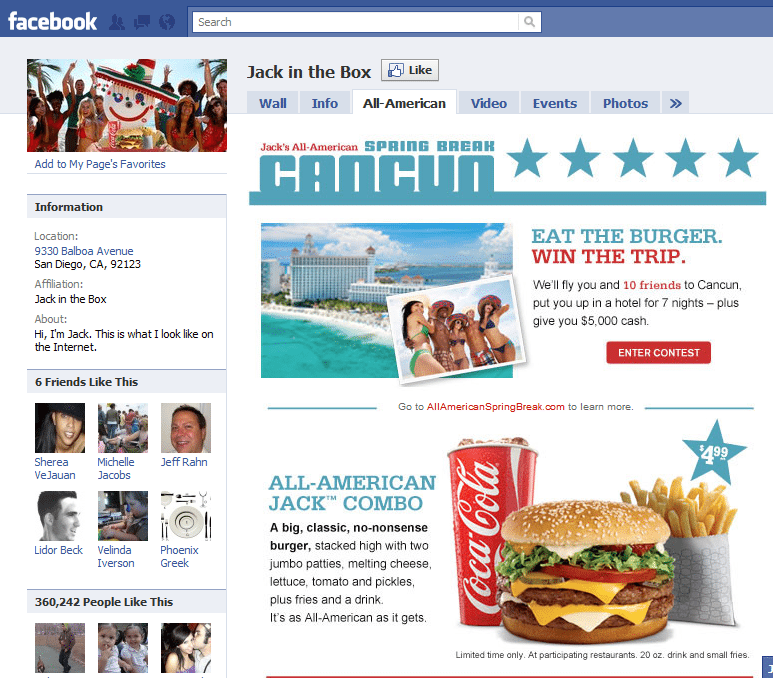 Read more about this at 10 Key Elements Of One Of The Top #Facebook Marketing Campaigns Of The Year. Popular fast food chain Jack In The Box, and their slightly creepy mascot Jack, added a nickel in an imaginary jar for every new fan they accrued on Facebook in their October Rich Fan Sweepstakes. They started at just over $2,000, and when they gave away the money about a month later to a randomly selected fan, the jar was up to over $11,500. Needless to say, giving away free money is one of the best and easiest ways to acquire new fans on the social network. It was certainly a creative campaign though that helped the fast food chain see an explosive increase in fan numbers. 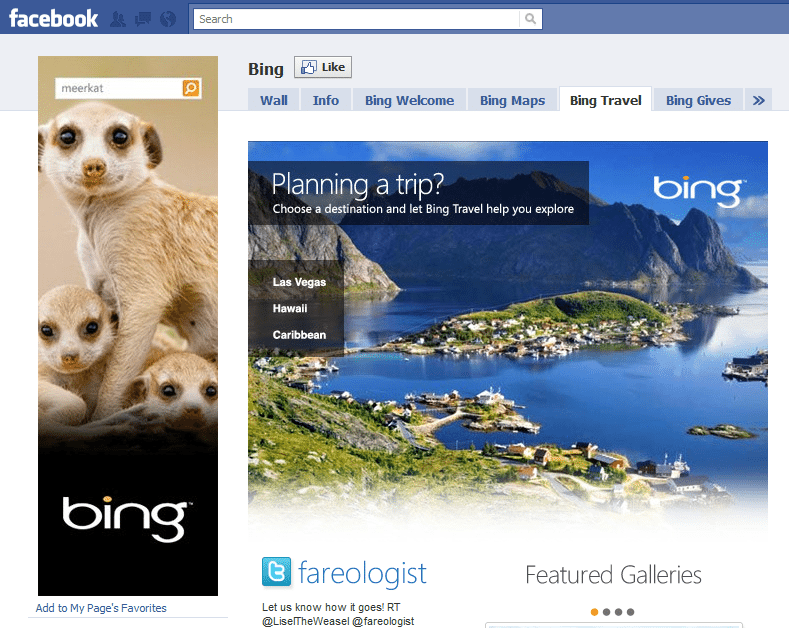 A little before the beginning of Spring, Microsoft’s Facebook page for Bing launched a campaign that helped them accrue almost a half million new fans on the social network. The search engine did this by giving away FarmVille currency to all new fans that hit the “Like” button. Bing drew in great traffic and their page grew rapidly, but engagement of the content on the page was drawn into question. The Microsoft page responded by making itself a hotspot with the latest news about the popular Zynga developed game to keep their new fans around. 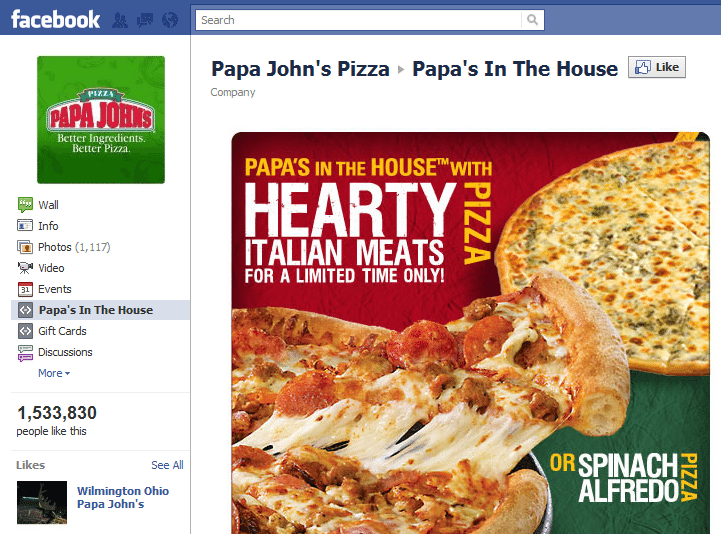 The first pizza chain’s Facebook campaign to appear on our Year End list is Papa Johns. They promoted their Papa’s Speciality Pizza Contest using Facebook, and it created quite a buzz and a growth in fans as a result. The contest put the fans taste buds and creativity to the test as it was up to them to come up with a new pizza for the company. The winner also saw a piece of the profits, so it was not too much of a surprise that this creative campaign helped the popular chain’s fan-base on Facebook continue to expand. To go a whole list without mentioning at least one company that has utilized Facebook’s new popular feature, Places, just would not be acceptable. Southwest partnered up with the Make A Wish Foundation for an excellent charitable promotion that had the airline donating a dollar to the organization every time a passenger checks into a Southwest served airport. 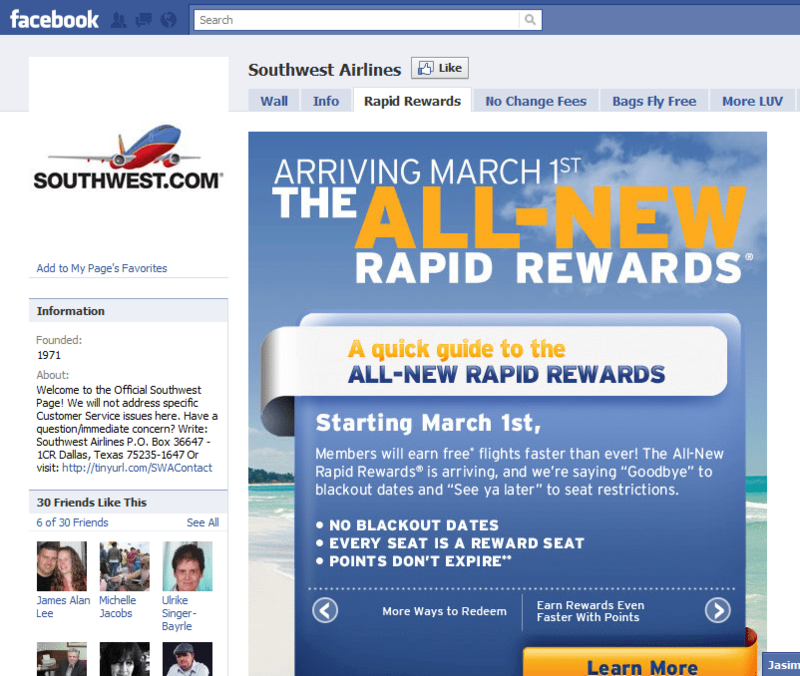 The promotion has had great success, as it is for a great cause, and it has it helped Southwest gain over 1 million fans on the social network. Be sure to check in on your next flight and join an excellent campaign. Popular cereal company Kellogg’s teamed up with Feeding America, and the Facebook page Kellogg Cares comes as a result. The page has been a quick increase in fans, and the content posted makes it such an interactive success on the social network. The page’s aim is to educate younger generations on proper nutrition through posts and video updates. Kellogg’s used Facebook in an extremely humane fashion to raise awareness for a particular issue. 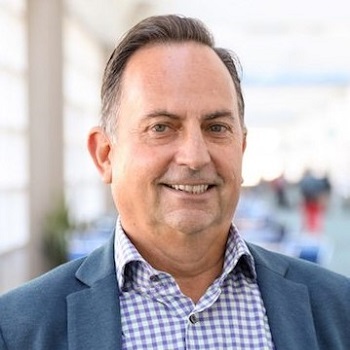 Domino’s Pizza has completely revamped its brand image this year through advertising campaigns, and a heavy focus on interactive social networks. As they were coming to the realization that their pizza previously tasted similar to cardboard, they started a tab on their Facebook page where fans could voice all of their complaints with the popular chain. 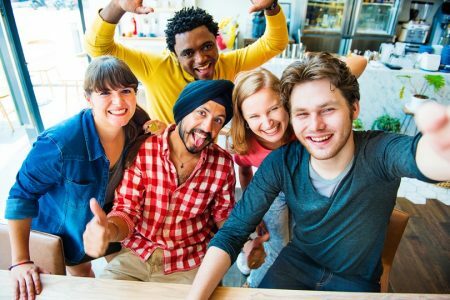 Regardless of any opinion on whether their new pizza has actually improved, their use of Facebook to listen fans opinions was a great way to begin to improve a deteriorating image that was initially attached to their brand. 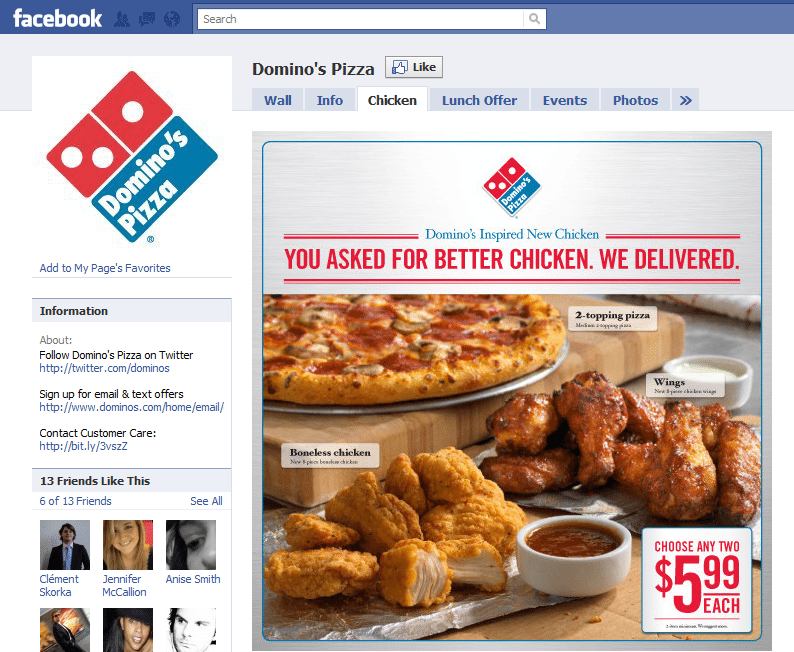 Domino’s continues to be extremely interactive on the page offering responses and updates for fans. 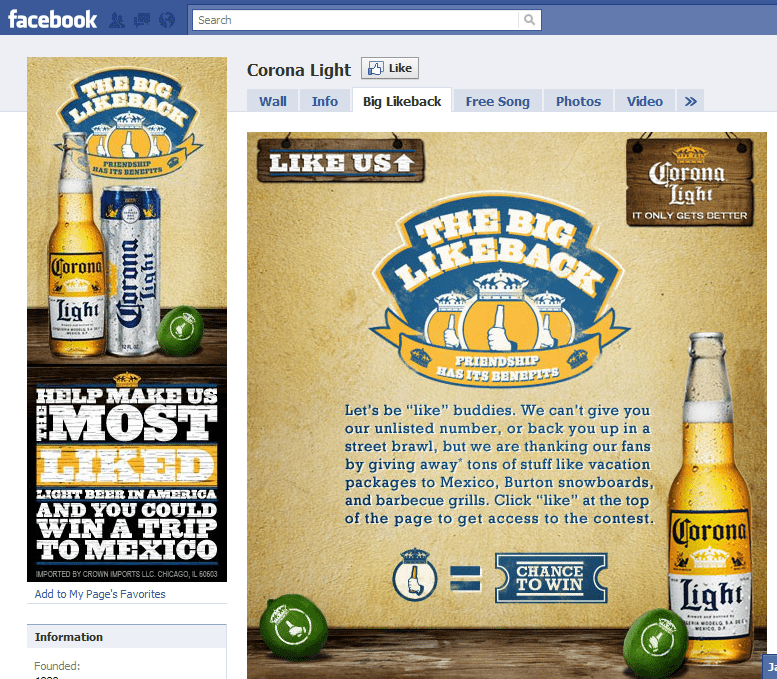 Corona Light cross-media campaign this past year included a goal to become “The Most Liked Light Beer In America.” A most notable part of this was to use Facebook, and by fanning the page you could see your picture up in the bright lights of New York City’s Time Square. The campaign was a great social media success in the sense that it had fans interacting on the pages as well as spreading the story of the billboard by word of mouth. The billboard ran for a month until the beginning of December, and many fans were able to snag pictures and be a part of this Facebook-based advertisement. 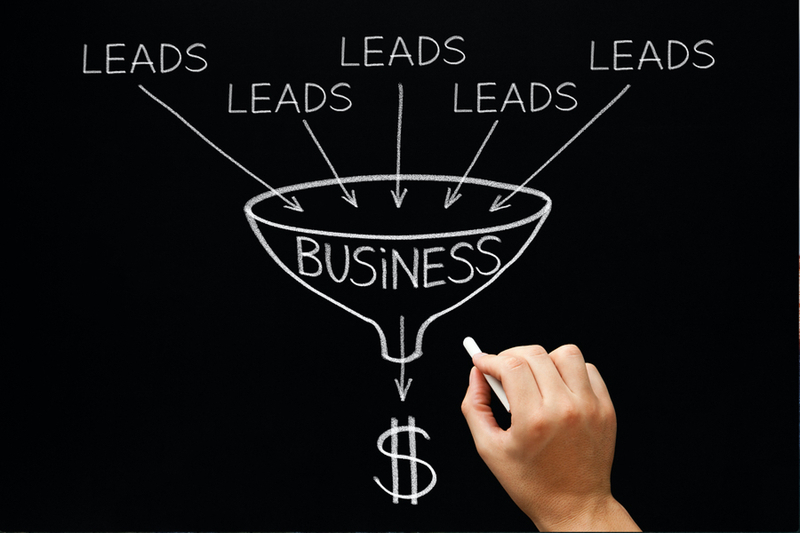 So what is a Facebook marketing campaign that you have noticed recently that impressed you? Look forward to reading it in the comments. 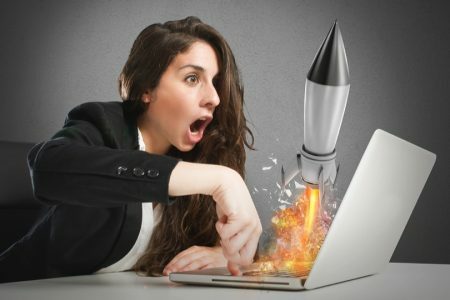 This list was sourced from Allfacebook.com which is a great resource for finding the latest information on all things Facebook.